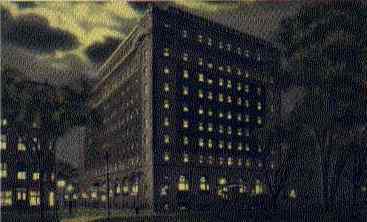 Bancroft Hotel (also called the Sheraton briefly) is at 50 Franklin St. was built in 1912-13 at a cost of more than ,000,000. The following are links about Bancroft Hotel you may find interesting. Also check out the other pages. The following are comments left about Bancroft Hotel from site visitors such as yourself. They are not spell checked or reviewed for accuracy. You can see where the extension down Portland Street was added by the white limestone strip running up the side of the building. 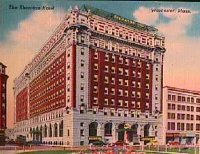 As the Bancroft,the hotel had (I was told by a great aunt who was a flapper) that there was a wonderful roof garden to the hotel with big bands and lots of outdoor dancing. The Sheraton took it over in the early 60s and I went to some dances there. The main ball room and the smaller Crystal Room, were handsome function rooms. 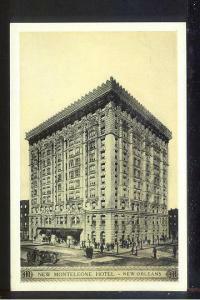 Named in honor of George Bancroft, this hotel opened on September 1, 1913 at a cost of $1.25M (1913 dollars). The Sheraton chain bought the building in 1942, but then changed the name back to the Bancroft in 1955. It was converted to commercial and apartment use in 1964. I have a letter my grandmother wrote on her honeymoon, dated November 29, 1941. She and my grandfather stayed at the Hotel Bancroft and she used the hotel stationery to write to her sister. I remember my Oldest brother working as the eleivator operator. He used to get to see any famouse people who came to worcester. He had recivied a $10.00 bill from Fanky Avalon who autographed it for him. A lot of the 50's singers used to come to Worcester. Now we have the Centrium and mostly Songs you can't understand. 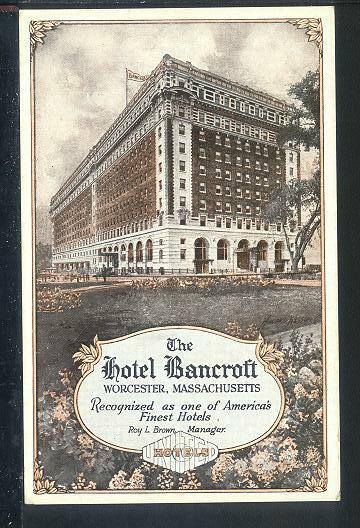 My grandparents, Frank Riley & Loretta Bergen were married in Worcester in 1919 and according to the announcement, they celebrated with a wedding breakfast served at the Hotel Bancroft. I understand that is where Sigmund Freud stayed while a visiting Professor at Clark. Isn't there a clock in the floor? For some reason, I was in and out of every building downtown, including the Bancroft. Wasn't the Eden Restaurant downstairs? I also recall other businesses downstairs and Liggetts drugstore on the corner across Portland Street. My father was the Supervisor of Services at the Sheraton Bancroft Hotel for many years. Our family saw it at its best and watched its slow decline into a urban hotel trying to compete with suburban motels. The hotel was the center of social and business activities in the City. Many weddings, family celebrations and city events took place in the Grand Ballroom. 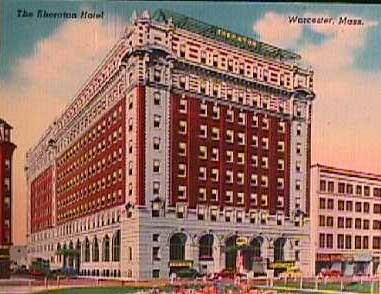 Also Worcester was an industrial power house and most business functions were held in the hotel. I remember my father telling me about the Hawkers (salesmen) coming to Union Station and the hotel transporting them to register. People should remember that for many years Worcester had extremely low unemployment and very high savings per capita. The City was alive with activity and it offered business people many amenities. The were many people coming to the City to do business with Norton's, Heald Machine, Wyman Gordon, American Steel & Wire, and the retail community. There is nothing left of that Worcester and the City is much poorer for it. I wish every young person could experience the excitement of walking through a two story grand hotel lobby with all its activity and people dressed in their up to date business clothes and/or their finest fashions preparing for daily business or a major social event. I recently moved to Worcester and decided upon the former Great Bancroft Hotel where all roads lead to it. Since living there I have started to collect artifacts and post cards from the hotel's era and way before it became only Bancroft Commons. If interested I would love to submit and share a few of my many post cards with others. They are actual photographs of the hotel and real people, cars ect from way back then. Please let me know if their would be any interest. Didn't WORC broadcast from there? I remember doing a debate on capital punishment there in the early 60's. I agree with tyler, i live in one of the buildings owned by Bancroft and run by the Mayo group. i have no heat still b/c the gas meters were shut off in june b/c of lack of inspection have been fighting with them to get this fixed. they are a total rip off. and i have to park at the end of Portland St about a 5 minute walk for $50 a flipping month, i also have a broken closet window which makes it colder and a leaking bathroom ceiling that smells bad. $775 for a tiny apartment nothing included like i was promised. My dad's first dental office after WWII was in the old Plymouth building on Main St. He moved 2 years after the Bancroft Hotel became 50 Franklin St. Regarding above comment of "C Forti". The Eden Restaurant was also called the "Eden-Sea Grille" or "Eden Garden" and was next door at 38 Franklin street. Always having a big front window display of fresh sea-food on ice. Downstairs in the Bancroft Hotel was as best I remember the "Bancroft Diner", the "Bancroft Restaurant" being upstairs. I currently live here in Bancroft Commons. It is really exciting to think of the great people and big events that have taken place in this building. It is the only place I have ever lived with this depth of history. My apartment is enormous and I imagine it may have been one of the premier suites in it's day, leaving me to wonder who may have stayed where I rest my head every night. Quickly, I feel that many residents here have unrealistic expectations for a building with so many units. I don't like every single thing about living here either(especially the elevators), but the bottom line is money. Unfortunately, if they don't have to, they're not going to. Sarah - your grandfather, Cap'n Joe, and mine, John Conroy, were friends. My grandfather owned the Hotel Mayfair (near Mechanics Hall) and I have sketches of your grandfather by Al Banx. I also have many old photos of the interior, menus, an autographed pic of W.C. Fields made out to my grandfather. to David Hight, your comments ring true. Worcester was a true powerhouse of commerce into the 1960's. 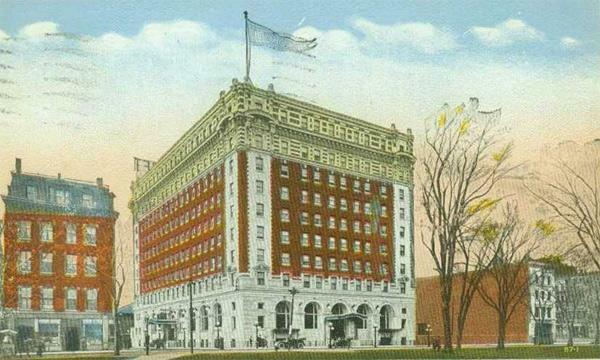 And the Bancroft Hotel was top of the line for business and social events. In a way its both good and bad that things get old and change. The Bancroft was quite a place in it's day. I am looking for pictures of the Hotel Mayfair which my uncle stayed at before shipping out to Europe when he was in the Army. My grandmother Edith Bancroft was a grandchild of George Bancroft. Her married last name was Coghlin. Coghlin Electrical still has a big Dept. store in Worchester and are my father Bancroft Taft Coghlin cousins. I have located a cousin in S. America who is a Bancroft. RE: Will H. 2010april18 "Mayfair Hotel". I suspect the hotel was the "Mayflower" not the Mayfair. See the "Warren Hotel" at this website. Dave I am sure that people have died in this building (I live here also). They say that children can see spirits! My mother, Rose (Arsenault) Greene was a singer at the Bancroft Hotel in the 1940's while my father, Robert W. Greene, was a bellhop. They loved working there and remained married all there lives. I recently purchased a chamberstick (candlestick with finger ring) made by O.P. Co. Syracuse China. It has an elaborate crest underscored by the word Bancroft. I enjoy researching old pieces like this to determine from where they came. It turns out it is from the Bancroft Hotel in Worcester. I found its likeness on the RWCN Forums (except theirs has gold trim and mine has dark blue trim. I have mislayed the cord which would allow me to upload a pic from my camera to my computer. When I find it, I would be glad to forward a pic to anyone who might be interested. I have enjoyed all the comments about the hotel even though I have never been there. My grandfather, Joseph Brooks, was sweeping down in the outside grated area and someone yelled...Look out! When he looked up, a bottle smashed into his head, causing him to go blind from that day on. The only compensation he ever received was the promise that any current and future members of his family would be given employment at the hotel, which never happened! On Feb. 17 1917 my grandfather George Snay fell from scalfolding while working as a brickmason. He died at 33. Two family emembers say it was the Bancroft Hotel another says it was the Harrison Richards Arms building. I cannot find any news articles. Katie, I don't know why but I never saw your comment until now! Wow I would be interested to see the sketches by Al Banx of Grampa! Sarah - My step-dad, George Short, was also a bartender there and friends with your grandfather. I remember going to Falmouth, to the Casino, and meeting your grandfather. I think there was a statue of him over the Casino. I also think we stayed at a boarding home near the Casino that was owned by a relative of your grandfather, and possibly, one of your relatives. Dear Will H. & Sarah, I haven't checked back for all these years! Will, you are correct about the Hotel Mayfair. It is indeed the name of the hotel which my grandfather, John H. Conroy owned. I have many pictures of the interior (and also the pics of Cap'n Joe, Sarah). I am heading down to my mom's in February and will find a way to upload them to this site! It so interesting to read these comments. I came across them because I'm trying to know the name of the hotel my grandparents owned in the late 1930s. My aunts and uncles have all passed on and now we're trying to name the hotel. From stories I heard, it was located in Salem Sq. I am not sure where that is in Worcester. Is anyone familiar with a Hotel in Worcester, near Notre Dame church. I don't have the exact address. Many names have come up but as I read about the Warren, the Bancroft, the Mayflower, etc.. They don't fit what we've heard in stories. Great memories of this hotel. Visits to Worcester with my family from CT. It might be the greatest factor on why I entered [as an adult] the hotel industry. It was a grand property, a jewel.